Plumb Construction was recently honored by the Harford County Economic Development Office for 40 years in business. 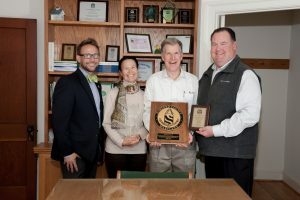 Steven Overbay, Deputy Director of the county office and Tucker McNulty, Senior Business Development Associate, presented Tom Rayner, President of Plumb Construction Company, with a plaque to commemorate the occasion. Read more in the January Newsletter. Bottom Row: Dave Vickers, Damien Ingoglia, John Gay, Bob Mongan, Dave Sweigert, and Randy Edwards. Top Row: Steven Overbay, Tom Rayner, Deborah Rayner, and Tucker McNulty. Pictured below left to right: Steven Overbay, Deborah Rayner, Tom Rayner, and Tucker McNulty.